While chemistry is not quite wizardry, this activity is so much fun and makes a great party favor, gift, or treat for excellent marks in herbology! A lot of important events in the Harry Potter franchise take place in various bathrooms. The most memorable for me is the bath in Harry Potter and the Goblet of Fire. This fun bath bomb will have your little learners excited for cleaning off all the dust from traveling by floo powder. Here are your fun facts about bath bombs. 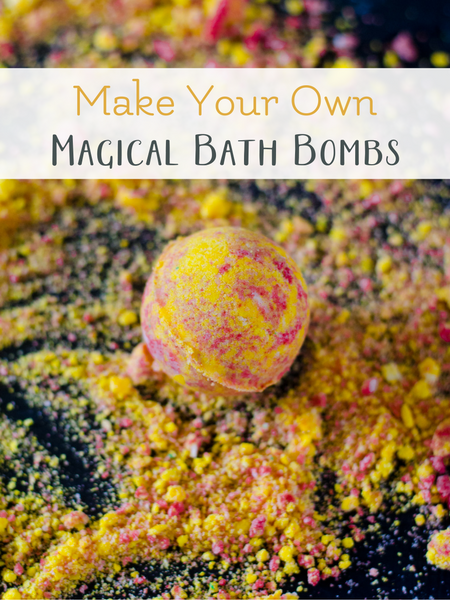 Bath bombs are made from citric acid and sodium bicarbonate (baking soda). Just like a very common antacid. The magic happens when the two chemicals combine with water. When the two chemicals begin to dissolve in the water they make sodium citrate (which is harmless and doesn’t do anything) and carbon dioxide. That’s where the bubbles come from! 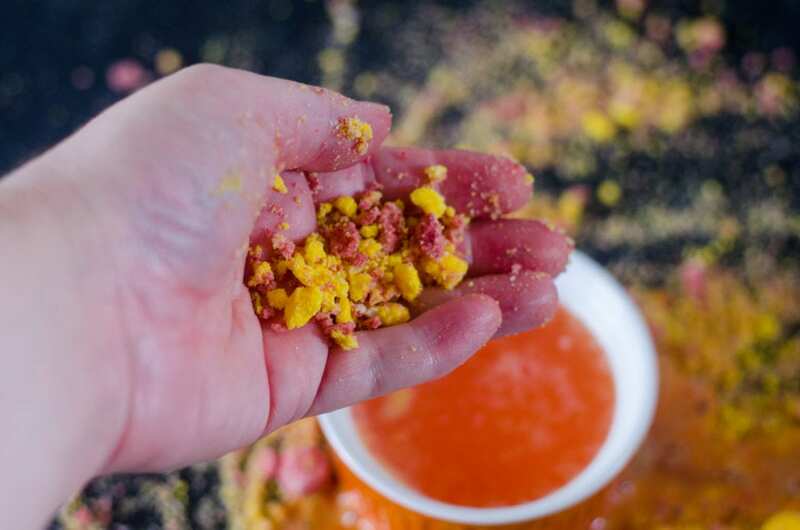 Those fizzy little bubbles break up the bath bomb and allow the oils, glitter, inner colors, and moisturizers to get into the water. In a bowl, add in corn starch, citric acid, and baking soda stir well. Add in coconut oil and stir with a fork to keep light and fluffy. Separate into two dishes. 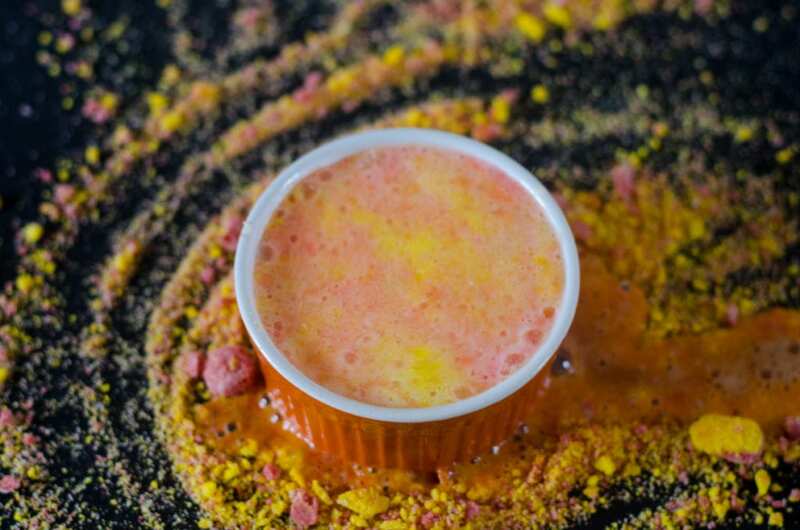 Add in fragrance and yellow coloring to one bowl and red coloring to another bowl. Stir well. Using the mold, mix yellow and red then pack both sides of mold then press together. Once you press together leave in mold for about a minute then remove and place on a tray to dry (harden) overnight. For gift giving, place your bath bombs in clear plastic bags and tie them up with matching ribbon. To change the bath bomb colors, all you have to do is change the gel food coloring. 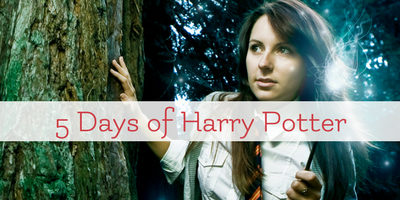 This post is part of our 5 Days of Harry Potter series!